Most of us when we are first introduced to tobacco blends have no idea that there are different types of tobaccos with their distinct characteristics. This short article is the tip of the iceberg to describe the few tobaccos used in our pipe tobacco we love dearly. Many of us ask ourselves if tobacco gets better with age. Tobacco blends to a certain degree can benefit from aging. The higher the sugar content in a blend the better it will age from a taste and longevity perspective. Now here are a few types of tobaccos used by manufacturers. Virginias are classified by their colour, such as “bright” and “red”. The location on a stalk is what determines the colour. The bright Virginia comes from the middle of the stalk, while the red Virginia comes from the higher portion of the leaf. All Virginias tend to be sweet, the lighter the colour the sweeter the tobacco tends to be. As the Virginia becomes sweeter, there is additional acidity and hints of citrus-like tartness, and as it becomes progressively darker in colours, the tobacco increases in flavour and the taste shifts to a bread like characteristic. Burleys have the lowest natural sugar content of any type of tobacco. On the other hand Burley has a tendency to have higher nicotine content in comparison to other tobacco types. Due to their low sugar content, Burleys are excellent for mixing blends, and, are exceptionally absorbent when flavors are added. This is the main reason that black Cavendish is made from Burley and most Cavendish bases for aromatics contain a high percentage of Burley. The presence of Latakia is what makes an English blend “English”. Latakia was originally produced in Syria. Initially, Latakia is air cured then further processed by several weeks of exposure to controlled fires of herbs and aromatic woods. This results in a condiment tobacco possessing a similar note to that of a cozy campfire. Syria no longer produces this type of tobacco in abundance. Latakia today mainly comes from Cyprus. Cyprian Latakia is a bit more bold and sweeter than its Syrian former cousin. Smoky Latakia is detected between levels of 3-5% present in blends while a noticeable sweetness comes to be present in the 10% range. Aromatic mixtures are vaguely defined as any blend having a flavoring agent added to it. Aromatics are most commonly blended to be mild in nature and almost always tend to have a pleasant aroma which draws positive comments from those around the pipe smoker. Most aromatics start with a black Cavendish base although Virginias and Burleys do appear but are less frequently used. After air curing has occurred, the leaves are pressed into a cake and then heated by either fire or steam. Once fermentation has progressed to the manufacturer’s specification which depends on the type of blend of Cavendish, it will either be used singularly or a flavouring agent will be added. In the case of most aromatics, a flavouring agent is added. As always enjoy the moment and enjoy your pipe. Mac Baren developed the 7 Seas tobacco blends to be in line with the American style of aromatics. They also note that: “All tobaccos in this line are predominately made out of Virginia tobaccos where most of the American made tobaccos have a base of Burley. Using the Virginia as the major player in our blends does make the taste more clear and crisp, and you avoid any unpleasant aftertaste.” I do have to agree with Mac Baren. There is no major aftertaste. I would also like to mention that choosing the right pipe makes a difference in the pleasure of this blend. 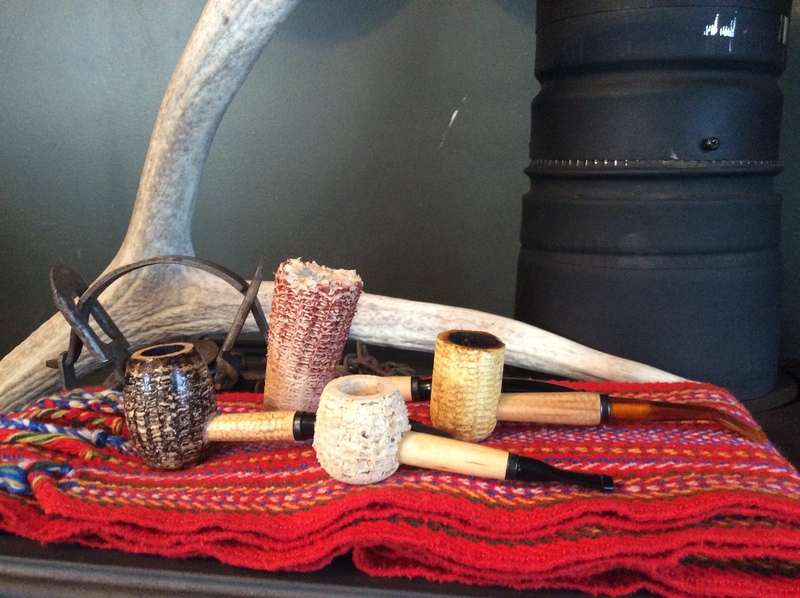 Use a briar pipe instead of a corn cob pipe. I don’t know why but it just did not have the same enjoyable characteristics in the corn cob pipe as it did in the briar pipe. Avoid tight packing and make sure to take gentle and slow puffs to fully enjoy this blend. This blend produces a very pleasant tasting, mellow sweet cool smoke with no tongue bite. This has to be in the top blends as an aromatic. It has very good quality casing and is not high in nicotine. As Mac Baren states: “Enjoy the beautiful colour match of Golden Virginias, light brown Burleys and a large part of Black Cavendish. Upon lighting up you will be met by a gentle sweet vanilla and dark chocolate.” How very true is the above statement. I hope this review helps you decide if this blend is for you. Don’t be afraid of adding to your repertoire and enjoy the moment with your pipe. I have only recently been introduced to Cornell & Diehl. When I started researching this company I was very intrigued by how the company started and how they make their blends. Each blend is made in the same meticulous way, by hand. From the initial barrel opening to to the final stages of the product, each step is manipulated by a person and not a machine. And, that is the main reason why there are so many folks who enjoy their hand blended tobaccos. Now, let me discuss the blend at hand, Autumn Evening. This blend is an aromatic and would be a great addition for the beginner pipe smoker or for those who want to enjoy what I call a dessert tobacco. The tobacco itself is fluffy and packs easily in ones pipe. I have found this blend to be as previously mentioned, very sweet and light. The moisture level is perfect as always and lights easily. Even when taking several puffs at a time, this blend was easy on the palette. The Red Virginias brings out the sweetness and for those with distinctive taste will notice the Virginia flavours such as chocolate and vanilla on top of the maple flavouring. No tongue bite was present throughout the experience and the blend was good to the last drop. No major flavour changes when reaching the half portion of the bowl. I noticed that this blend burned easily. I will also mention that the aftertaste remains sweet and pleasant. And, as labelled, the room note is very enjoyable for those surrounding the smoker. The Medico brand first made their appearance through the S.M Frank & Co. Their first breakthrough was in the early 1930s. There were some concerns about the tars and nicotine found in the tobacco smoke. In order to meet the demand of pipe smokers, the S.M Frank & Co., introduced the Medico pipe filter. The filter mellowed out the flavor of hot tobacco smoke as well as capturing the tars and nicotine. This system creates a smoother smoking experience. In order to accommodate the various types of pipes, the company made their absorbent paper pipe filter in standard 6mm size. All Medico pipes are made with their signature Medico push bit with a filter inside. In 1966, the company developed and began offering a new type of synthetic pipe called Brylon. Brylon is a combination of traditional briar wood with resins. I am not a fan of this type of pipe bowl but there are a few that enjoy the Brylon pipe. If you are purchasing a Brylon pipe due to the cost, I would advise you to spend your money on a corn cob pipe to familiarize yourself with a pipe and pipe tobaccos. A little research goes a long way. Today, the Medico pipes are still a top selling brand. I would like to review the Canadian Varsity, Conqueror and Esquire pipes. Yes, there is a difference between the Canadian and U.S. versions. Principally being the name, material of the bowl and where they are being produced. The Esquire model comes in different colours and variation of styles. Made of briar wood and made in Italy, this pipe not only looks good but feels nice sitting in your hand. Many have complained that Medico pipes are lighter. I weighed them and they average 40-45 grams whole. My Lorenzetti Raffaello weighs in at approximately 55grams. They may be somewhat lighter but they certainly have the right thickness of bowls to prevent any burnouts. The stem has a nice bend and fits nicely in ones mouth. The bit and lip are not wide but has a comfortable feel inside ones mouth. Notice in the pictures how the lip is offset. Upon removal of the stem, I notice that a Medico pipe filter was not included by the manufacturer of the pipe, although a filter can be secured in this pipe. The stem does fit snugly in the bowl. The grain of the wood is vertical which is what helps in making a good pipe. The Varsity comes in all sorts of variations and colours. Made of Briar wood and made in Greece, this pipe definitely would resemble the ones your grandfather had in his collection. I have to say that I like the simple ‘look’ of these pipes. No fancy ferrules or markings. Upon removal of the stem, the tenon is made of metal. The stem is wider than the Esquire model and has a wide bit and lip as seen in most Italian pipes. Same great feeling in ones hand and mouth. What truly impresses me with these pipes is the absolute beauty of the briar wood. The veins in the wood grain are what makes these pipes stand out. As for the Conqueror model, I would not be afraid to throw it in the same category as the Varsity. Simple and elegant another pipe that would fit nicely in ones collection. Made of Briar and made in Italy. The stem, bit and lip are the same as the Varsity. As many have attested, Medico pipes are affordable and are made to stand the test of time while providing a quality smoking experience. If you don’t have a lot to spend on a smoking pipe, and really don’t want to start off with a corn cob, then I would certainly recommend a Medico pipe as a small investment. Brigham has been long known for affordable briar pipes that feature their unique Rock Maple filter system. Their unique system reduces tongue bite and excessive moisture in tobacco. They offer a wide variety of shapes and finishes in their world famous pipes. To add to their well reputed pipes, Brigham offers a full line of tobacco blends that cover a wide variety of genres which deliver great value just like their popular briars. Some say that butterscotch is the distinctive flavour and smell found in this blend. Others, argue that the blend smells and tastes like vanilla and caramel. On the other hand, my wife smells currants and vanilla alcohol. Nobody truly knows due to the secret recipe. But, if there is one thing in common between all enjoyers is that the room note was very satisfactory to all, including, non-smokers. I myself greatly enjoy this blend and find it to be soft on the palate, yet full and satisfying. If you enjoy Virginias, this blend might be as they say too soft (sweet) due to the Green River Cavendish being the main ingredient. The tobacco is light in consistency unlike other blends such as a Scottish mixture. This tobacco does fill a bowl somewhat easily. As for lighting, many have said that the blend is too moist. If you happen to agree, simply take a paper coffee filter and put the desired amount for approximately 15 minutes prior to smoking. I find that Brigham’s Own is a pleasant smoke and anyone will find that it is cool if you don’t rush your smoke. That being said you should always take your time smoking a pipe. Enjoy every minute of it. Depending on how you ‘pack’ your pipe, your bowl can easily last you 25-45 min. If you are new to the world of pipes and tobacco, this blend should be added to your inventory. Please note that this blend is considered an aromatic and should not disappoint those who enjoy aromatic tobaccos. Indeed, in my opinion, this tobacco is an an ideal smoke for anytime of the day. To recap, strength is very mild to mild, flavouring is medium, taste is medium and room note is very pleasing. I will certainly keep this tobacco in my repertoire. I don’t know about you, but I can attest to you that when enjoying a pipe in the evening, there is a great difference between cheap floor sweeps tobacco and great tobacco. Worse yet, there is not much difference in pricing. From fifty cents to a mere dollar difference. Why wouldn’t you want to enjoy high end tobacco? If you’re new to the world of pipe tobacco don’t get scared by all the options available to you. If there is no one to guide you, you just need to be honest with yourself. Just like coffee there are different blends and strengths. This also includes types of tobacco. From rich Latakia to Virginias. Here are some blends that I enjoy and a few recommendations for your enjoyment. I do say enjoy because pipe smokers care about the tobacco and not a nicotine hit. Here in Canada we have Brigham Enterprises providing pipe smokers with great products at a reasonable price. From their famous pipes to the various blends Brigham has been in the game since 1906. The one blend that stands out for myself is Mr. B’s Brigham Own. This blend can be enjoyed any time of the day. This blend consists of Green River Black Cavendish which is expertly blended with Burley and Virginia tobaccos. The outstanding flavour and aroma are achieved by the addition of a secret flavouring recipe. Retail value for 50 grams approximately 25 dollars. Now, if you’re used to your grandpa’s blend and couldn’t find it at the time. It might have been a Dunhill blend. They have re-introduced some blends for us such as Durbar. Durbar is a historic brand blended with a high proportion of mature, dark and yellow virginias, together with Latakia and oriental leaf. Wonderfully balanced, nice gentle flavour, with a floral and subtle smoky taste. Retail value for 50 grams is approximately 35 dollars. Now if your thinking no that wasn’t it. Here’s another historical blend. Bell’s Three Nunn pipe tobacco. If there was one pipe tobacco talked about, it was Three Nunns. The recipe dates back to the 1800s. A real favourite of the english, this blend is smooth and mellow and was inducted into the tobacco hall of fame. Blended with African Virginias and African Dark Fired Kentucky tobaccos this blend gives you a natural sweet taste combined with a slightly smoky note. Retail value for 50 grams is approximately 45 dollars. Another great blend that I am sincerely enjoying is Scottish Mixture by MacBaren. Introduced in the 1950s, this mixture combines over thirty five different tobaccos from Virginias, Burley and Original Cavendish as well as what I suspect is a very nice whiskey flavour. Others might say a fruit sweetness. This blend is easy to fill in a pipe and is slow to burn. Retail value for 100 grams is approximately 60 dollars. There are many other blends to discover, but, these different blends are very suitable for the beginner or the connoisseur of fine tobacco. You won’t be disappointed with any of these blends. Until the next time, let’s enjoy what our forefathers have given us through their hard work and devotion. Fabric Repair Tattoos who would have thought. Having a brand new jacket rip on you is not an enjoyable moment. It may feel like all your hard earned money was just thrown down the drain. I never feel like throwing anything away. Usually I find another purpose for whatever. Like turning it into a bush jacket. But, when I found this product I was very excited and decently surprised about the simplicity. The product is from McNett Gear Aid and is called Tenacious Tape Tattoos. All I needed to do was simply clean the areas with Isopropyl Alcohol, let it dry and apply the tattoo by applying pressure from the center out. It was that easy. There is nothing more relaxing after a hard days labour, in my mind, then to sit down and enjoy good tobacco in a cool smooth smoking pipe. And, if you happen to be of French-Canadian ancestry you might want a spruce drink along with that or whatever your drink might be. I have encountered these wonderful pipes while on a trip in the Northern United States. Before the encounter I have heard little about corn cob pipes. That is, most Canadians are accustomed to the typical European style pipe. Made of either Briar wood or of the cheaper version called Brylon -a man made material. While using European style pipes, I have found that I needed to clean them religiously and the flavour of the tobacco was very much affected by the burnt bowl making the smoke undesirable. Which is very different while enjoying a corn cob pipe. You need to try a corn cob pipe to fully enjoy the benefits. As the company advised me you can enjoy any tobacco in a corn cob pipe. You don’t need to purchase expensive tobacco for your smoking ritual. As you smoke a corn cob pipe you are guaranteed to have a cool, flavourful and sweet taste induced by the cob. The pipe itself is very easy to clean and you rarely need to clean your bowl. A slight tap with your palm is all you need in most cases. When thinking of corn cob pipes you might be thinking of Popeye and the very basic style corn cob pipe. Well you can get a traditional looking corn cob pipe, but, know that they come in various sizes and styles for today’s pipe smoker at a fraction of the price in comparison to the typical briar pipes. There is only one original and only corn cob pipe manufacturer is the U.S. and that is the Missouri Meerschaum Company. I have to write that information since there are chinese knock-offs and they absolutely do not compare to the originals. It’s the way they make and process the bowls that is the secret. You can change the bit but you can’t make any changes to the bowl. The bowl has to be light, porous and fashioned in a very traditional way. Just like the trapper who inspired and asked Henry Tibbe in 1868 to make him a cool, sweet smoking pipe, let us be pleasantly surprised and enjoy in the tradition of the corn cob pipe as millions of people all over the world have been doing. I have had many people looking at me in an odd way when I tell them that I don’t bother yelling at my dog to come. I simply use a whistle. Yes, that’s right I whistle trained my dogs. Anyone can do it. Just start the way you would any obedience training -on leash. Make it clear to your dog what you want from them and simply progress. I usually make sure that all my voice commands are 100% in order to proceed with whistle training. If you still think this is odd, look at the shepherds and how well trained their Border Collies are, or, bird dogs for that matter. Really, anyone can do it. As mentioned start your whistle training -on leash and progress from there. If you see your dog gives you a hard time, like any other training, go back one step. Once you feel that your command is 100% go forward with your training. There are many videos demonstrating the techniques used by shepherds as well as Bird doggers. It’s up to you to decide what technique is appropriate for you and which whistle(s) you would like to use. Shepherds use a mouth whistle to reach different ranges/frequencies such as the Acme 575. While bird dog trainers use either straight pealess or pee whistles which only have one frequency, one tone. Such as the Acme 210.5 (pealess) as well as Acme thunderer 670 (with pee). And, if you need long distance range then there is the Acme 901 Hellova whistle. I have to say that my preference for whistles is the ACME company. They have been making whistles since 1870 and they are still made in the U.K. They know what they’re doing. If you are wondering and telling yourself you want to whistle train your dog but would like to keep it simple. Sure you can just be consistent. By that, I mean if your recall is a trill ( toot,toot, toot), stay with that tune and don’t change it. Make up your mind as to what you want in training. I always like to use one short toot to indicate “Hey pay attention, I have a command coming at you” then whatever else you would like to add. For instance, “Pay attention, I need you to … stay, come, go left, go right, towards me, further (straight on)” and so on so forth. You can actually turn this into a game. Toss a toy somewhere the dog won’t know where to go and show them where it is by indicating/telling him where to look. Keep your training sessions short and sweet. Approximately 15 minutes. Always end on a good note. Never train your dog when your not feeling right. Common sense right. Not always, since some people including myself have to fight the urge especially i.e. when your dog did not listen to you when visitors showed up out of the blue and jumped on them and didn’t listen to your recall. Remember puppies are puppies they will go through their phases and your mature dog is like a three year old. Be careful about it as you don’t want to ruin all the hard work you put into your training. If you can have a bad day so can your dog. I hope this information helps those who were thinking about whistle training but were uncertain about how to go about it. Have fun with your best friend. I know I do and I love to show off my training progress and levels to others. Remember, you’r making it happen with your hard work and perseverance. © Marc Harrison and WildMan Tradingpost, 2015. Unauthorized use and/or duplication of this material without express and written permission from this site’s author and/or owner is strictly prohibited. Excerpts and links may be used, provided that full and clear credit is given to Marc Harrison and WildMan Tradingpost with appropriate and specific direction to the original content.